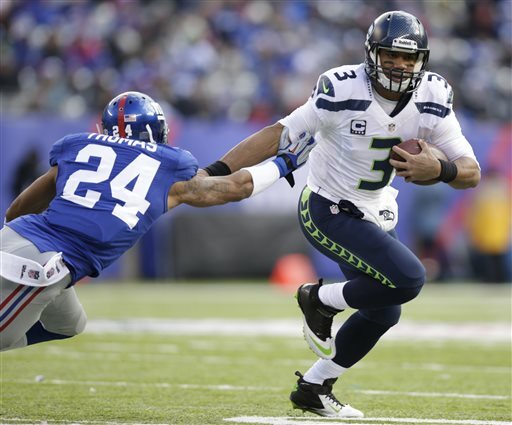 Will anyone slow Russel Wilson and the Seahawks’ roll back to the site of their 23-0 drubbing of the Giants? Two weeks remain in the 2013 regular season for all 32 NFL Teams, and 19 of those teams remain mathematically alive for a playoff spot. Seven of the eight divisions (seven!) have yet to name a champion (the Colts clinched the AFC South two weeks ago). There are scenarios where teams could either grab the #1 seed or miss the playoffs depending on whether they win or lose their last regular season game. One example of such a scenario: if the Ravens and Dolphins win their remaining games, the Bengals beat the Vikings, the Broncos lose their remaining games, and the Chiefs beat the Colts and lose to the Chargers, the Patriots (who would go into their final game against the Bills with a record of 10-5 due to their loss to the Ravens) would be 11-5 if they won and have the #1 seed (by virtue of their tiebreaker with the Broncos). If they lost said game, they would be 10-6, and miss the playoffs entirely, losing the tiebreaker to the Dolphins for the AFC East title, and the tiebreaker to the Bengals for the #6 seed due to the head-to-head matchup. While such an eventuality is obviously unlikely, the very fact that a situation like this is possible this late in the season is astounding. The last time the NFL had a conference dynamic like this was in 2002, when both the Titans and Raiders were 9-5 with two games remaining and faced the possibility of either missing the playoffs or being the #1 seed in the AFC. The Raiders ended up with the #1 seed at 11-5, tied for the worst record for a team with homefield advantage since the season went to 16 games. After all that, I think you can guess the theme of many of the comments following each team in our rankings this week. Philadelphia Eagles (8-6) – The Eagles have a difficult remaining schedule, going up against the Bears and the Cowboys. Still, given a Cowboys loss this week and a win by them, they will be the NFC East champs. Otherwise, we’ll have an NFC East Championship game in Week 17 for the fourth time in five years. What do you think? Agree? Disagree? Let us know in the comment section below!